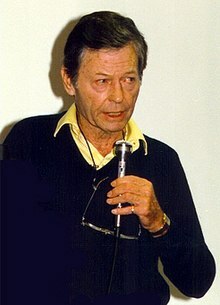 Jackson DeForest Kelley, at a Star Trek convention. Jackson DeForest Kelley (January 20, 1920 – June 11, 1999) was an American actor. Kelley is most famous for his role as Dr. Leonard McCoy of the USS Enterprise in the television series Star Trek and the six movies that followed. Also known as well as an older Admiral Dr. Leonard McCoy, Star Fleet Surgeon General Emeritus, in the Star Trek: The Next Generation television pilot, "Encounter at Farpoint". This page was last changed on 8 April 2018, at 05:28.